In part one we discussed how fiber alignment makes changing angles of exercise a scientifically sound practice. Score one the bodybuilders of the 40s, 50s and 60s. To build our case further on why variety is important we will look how some muscles origins also allow us to use variety and key exercise selection to our benefit. You see the origin of a muscle is where it originates and the insertion is where it inserts back onto the manipulatable bone, anchored by tendons. 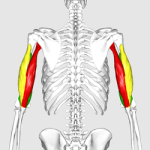 A muscle pulls to its origin, and in addition each head of the muscle has different origins. 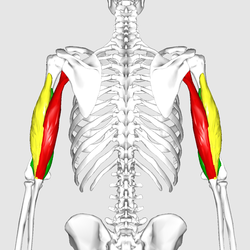 If you look at the picture below we can clearly see the triceps long head origin( The red one) is different than the other two in that it crosses the scapula. This is really a anatomical stroke of luck because by the Long Head crossing the shoulder joint it can aid in shoulder extension. Which in turn means it is stretched during shoulder flexion and can produce the greatest force in that position. Alternatively when the arms are down by the sides it is entering a state of contraction so the Medial and Lateral heads do the most work as they are in a more effective position. Brad Schoenfeld uses an example of a slingshot to illustrate this point. If a muscle is in a stretched position it is able produce more force, just as the farther you stretch a rubber band. But if the muscle or head is already in a flexed ( or short) position it cannot produce force as effectively. Note- Shoulder Flexion is when you raise your arms in front of your body , such as during a barbell front raise. What this means is that exercises that also include shoulder flexion( such as overhead raises) emphasize the long head and movements that have the arms down by your side emphasize the medial and lateral heads. I hope that further helps you in understanding advanced exercise selection. Part three will release soon. Wonderful blog! Do you have any suggestions for aspiring writers? I’m planning to start my own website soon but I’m a little lost on everything. Would you advise starting with a free platform like WordPress or go for a paid option? There are so many choices out there that I’m completely overwhelmed .. Any recommendations? Many thanks! I blog quite often and I genuinely thank you for your content. This article has really peaked my interest. I will take a note of your site and keep checking for new details about once per week. I subscribed to your Feed too.